NEITHER war nor individual combat is won solely by defensive, Maginot Line psychology or tactics. In personal combat, it is often difficult to determine where defense ends and offense begins. Often the only defense is a good offense. However, in all cases, a knowledge of possible methods of attack enables a defense to be better planned. The methods advocated in this chapter are simple and are based on a style of fighting that knows no rules, that depends on speed and ruthlessness for results. Boxing and wrestling are sports. They can be used only to a limited extent in vital combat. The fighting tactics discussed here, however, are designed to knock ■ out, maim, or kill, as the situation may demand. 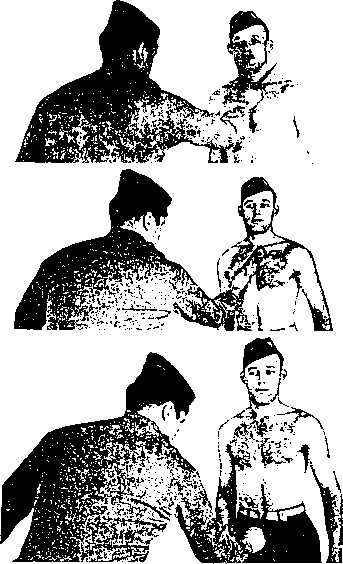 Types of hand-to-hand combat that demand set positions and complicated maneuvers—for the attacker and his opponent—are practically useless when the ordinary man finds himself projected into physical combat at an unexpected time. To be able to rely upon and use instinctively a specific hold or throw for each set or different position of an opponent is a difficult task. To be able to do so swiftly and instinctively demands months and sometimes years of practice. It takes time to train the mind and body to react to each set of conditions instinctively and in the prescribed method. This is one of the weaknesses of the jiu jitsu technique. By certain maneuvers and movements, a jiu jitsu expert can place an antagonist in the proper position for a specific throw; but for the layman it is much too complicated and, according to American standards, takes too long to learn.